We’re going to start something new on Prognosis this week. It strikes me that, each week, there is an avalanche of news about not only new policy developments in healthcare but also new innovations in both medical technology and health practices. It’s impossible for any one person to keep up with it all. So, each Friday in this space, we’ll spotlight some of the most interesting developments in U.S. healthcare from the week that either bear repeating or may not have captured the widespread attention they deserve. • In Tennessee, physician, hospitals and insurers are working together to improve care and reduce costs. • A leading insurer, Aetna, is providing grants to a number of universities to better understand the causes of life-endangering obesity in minority populations. • Is there an app for that? The Institute of Medicine is challenging college students to use mobile smartphone applications and social networking to address health issues on campus. • And speaking of smartphones, the McKesson Corporation announced a plan to sponsor research into how mobile technology can be used to improve patient care for Americans with diabetes. Some more interesting information has come to light on the issue of medical liability reform. At the annual meeting this week of the American Academy of Orthopedic Surgeons, a new study was released that helps us better understand the extent to which medical professionals order unnecessary tests and procedures as protection against possible litigation. There have, of course, been studies in the past based upon physician surveys. In this case, though, over 70 orthopedic surgeons in Pennsylvania were asked to track, over an extended period of time, whether an action was taken because it was for essential clinical care or if was a case of practicing defensive medicine. As the Associated Press reported, the study showed that one in every five tests is ordered for defensive reasons and 35 percent of all costs can be attributed to defensive medicine. 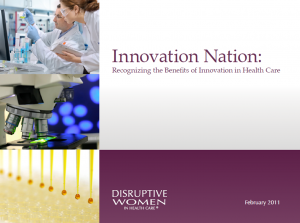 Yesterday, the Disruptive Women in Health Care blog released its latest e-book, Innovation Nation: Recognizing the Benefits of Innovation in Health Care. It’s a compilation of recent blog posts, bringing together diverse perspectives on the various issues affecting the future of American medical innovation. The articles in this e-book paint a clear picture of what’s at stake as the private and public sectors alike focus on what must be done to maintain the United States’ status as the world leader in healthcare innovation. Now that gasoline is over three dollars a gallon, I wince a little every time I fill up my car. It would be nice to have the power to simply decree that gas prices be 50 cents lower, but I understand that my pocketbook preferences do not take precedence over basic marketplace factors that range from the cost of oil exploration to rising energy demand in China and India. There is still an insistence on the part of some, though, that governments should set healthcare prices (more than is already the case in Medicare and Medicaid), regardless of actual cost of producing and delivering healthcare goods and services. This issue arises because of a report from Boston’s National Public Radio affiliate, WBUR-FM, that the Massachusetts Governor may ask the state legislature for the authority to set the rates that hospitals can charge. That authority would kick in if, after three years, hospitals are requesting increases of more than two percent. This idea of government setting prices is, of course, neither new nor limited to the Bay State. During the debate over health reform, proponents of a government-run health insurance option cited Medicare as a model of “efficiency” because it establishes the payment levels that physicians and hospitals can receive. That’s fiat, not efficiency. Similarly, there are constantly proposals bandied about to affix price ceilings to virtually every healthcare sector from insurers to pharmaceuticals to medical devices. That’s also the problem with the Independent Payment Advisory Board, scheduled to be implemented as part of the Affordable Care Act. It’s an entity empowered to slash healthcare spending without regard to achieving greater quality or value. The problem with having government simply decree what any one sector may charge for its services is that this approach ignores the interrelationship between insurers, providers, manufacturers and consumers in determining the value of healthcare services. It also undermines the ability of health system participants to provide greater value through innovation. There’s no question that we do need to focus on improving healthcare’s affordability. The way to do that, though, is through new, innovative health delivery mechanisms, a greater reliance on evidence-based medicine, a more intense focus on wellness and prevention and strengthening the ability of consumers to be discerning healthcare shoppers. For government to simply declare that certain prices must be lower may bring a measure of short-term relief, but there’s a price to be paid, whether it’s in the form of cost-shifting, reduced access, impaired quality or less innovation. Just saying a cost is lower isn’t the same as actually making it lower through marketplace mechanisms or greater ingenuity. As the House Judiciary Committee works toward the passage of medical liability reform legislation, the nation’s trial lawyers – who, of course, have the most to lose if tort reform becomes law – are stressing the counterintuitive argument that states which have enacted liability reform actually have higher healthcare costs. I suspect the good men and women of the trial bar are aware that they are freely mingling apples and oranges here. Texas’ healthcare costs are driven by the fact that the state has one of the nation’s highest uninsured populations, meaning that a comparatively higher percentage of patients are receiving their healthcare through emergency rooms. And as for the McAllen, Texas reference, the American Association for Justice should read the Atul Gawande article in the New Yorker that documented the McAllen situation, which involves Medicare billing practices and has no linkage to the state’s liability laws. The medical liability reform is an important one and deserves a serious discussion. Turning logic on its head to make a point doesn’t contribute to the dialogue.